Merson makes huge claim about Almiron, Rondon & Perez – Great to hear, but hard to agree.. – NUFC blog – Newcastle United blog – NUFC Fixtures, News and Forum. 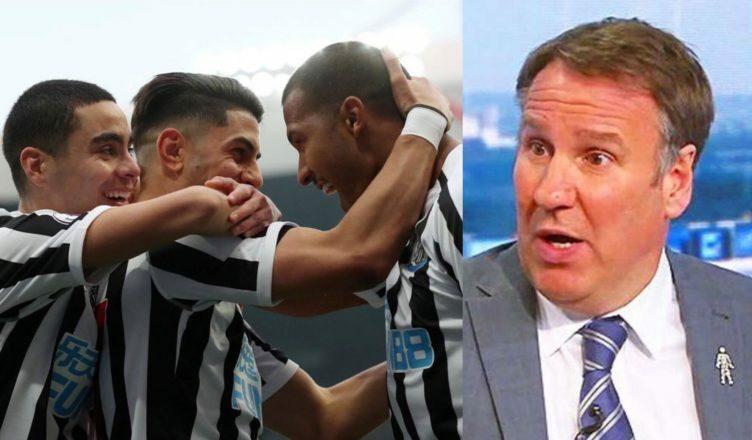 Paul Merson believes Newcastle’s new attacking trio of Almiron, Rondon and Perez is now the best attack in the bottom half of the Premier League ‘by a million miles’. It is fair to say our attack is suddenly superior to that of our relegation rivals – and that’s the key for now – but there may be a few ‘bottom half teams’ who will contest Merson’s claim here; and rightly so. Palace (13th) have Zaha, Batshuayi and Townsend, Bournemouth (12th) have Wilson, King and Fraser, while Leicester attackers Vardy, Maddison, Barnes and Gray not to be sniffed at either. As much as I’ve loved what I’ve seen from our ‘three amigos’ following Almiron’s arrival, these claims are perhaps a little premature and over the top from Merson – someone who’s been full of praise for Rafa’s Newcastle following our rise to form. Either way, I agree with Merson’s message – we do finally have an attack with balance, flare and the ability to give teams something to think about – but I think the ‘Three Amigos’ have a little way to go yet before we can call them them a ‘million miles’ better than any other attacking trio in the bottom half!